Xanitos approaches linen management and control in a systematic, structured fashion. 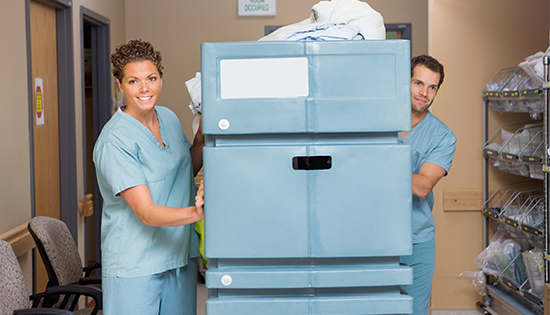 Xanitos evaluates the hospital needs through an on-site review, analyzing linen data, assessing work-loads and volume, and examining textile mix. Xanitos operates laundries and depends on the decades of experience of our National Director of Laundry and Linen, Shawn Jeffrey, Regional Vice President, Tom McCullough and CEO and President, Michael Bailey in delivering high quality service to our growing client base. This knowledge and experience in managing laundries combined with Xanitos' industry leading EVS programs has allowed Xanitos to deliver significant linen program savings and quality improvements to a number of Xanitos clients. Key components to Xanitos' program include educating linen users in methods to utilize and control linen to ensure maximum usage efficiency, offer supplementary new hire training in linen usage, and provide analytical reporting methods to assist in tracking linen use. Better service by ensuring departments never run out of linen. Better quality by identifying and removing poorly laundered or damaged linen pieces. Carefully monitoring and reconciling soiled linen sent out to the laundry and clean linen received back to be sure that linen is not being "lost" by the laundry and that the claimed laundered poundage is accurate. Analyzing and optimizing linen flow within the hospital to ensure there are no shortages that could give rise to wasteful "hoarding" by departments. Working with linen utilization committee to ensure that linen is not being misused. "I like the way you (Xanitos) take pride in the presentation of the plant. It is obvious Xanitos really cares about providing the best possible service and a quality product."